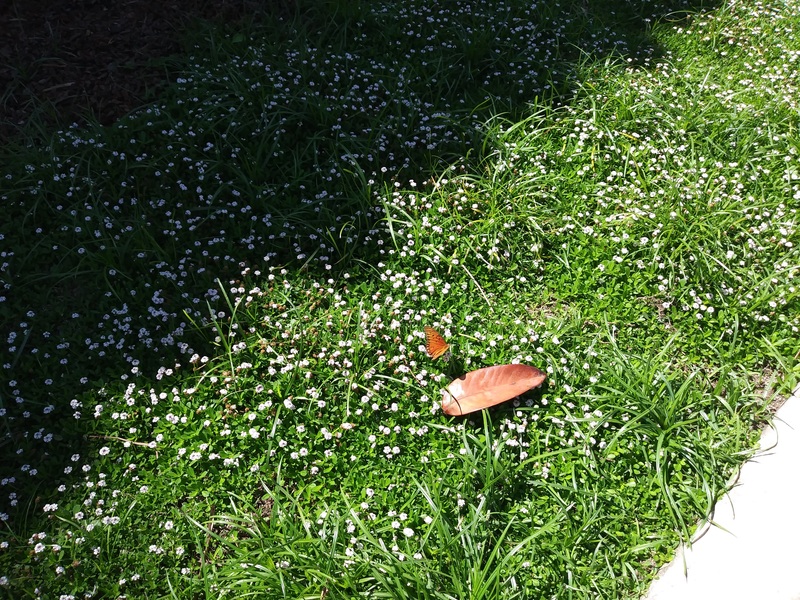 Date notes: Orange butterfly photographed outside of Angeles Mesa Library, 2700 West 52nd Street, Los Angeles, CA 90043 on Saturday, Sep. 8, 2018 at 12:10 p.m. on flowery lawn surrounding library. Observation notes: This photo is as close as I could get to it before it flew away from the library's lawn. Zoom in on the brown leaf and you will see the orange butterfly above it. I thought it was a Monarch. As I zoom in, I see it is probably not a Monarch. When you zoom in, you will see it has an orange body. I have never seen a Monarch with a bright orange body. Plus, the orange butterfly in the photo does not have thick black lines on the top side of its wings with white spots on them. I have searched online, but I am unable to identify this orange butterfly. The library is embedded in a residential neighborhood where there are plenty of yards nearby and not a lot of motor vehicle and pedestrian traffic. I have searched online, but I am unable to identify the little flowers the orange butterfly was drinking. I thought it was Clover flowers, but I zoom in, I don't think so anymore. Perhaps BAMONA reps. can contact the gardeners contracted by the Los Angeles Public Library in order to identify the flowers planted in Angeles Mesa Library's lawn.